Jessica Kolbe is a Level 3 certified Tai Chi and Qigong teacher and a certified instructor of Integral Energetics and Primordial Qigong. Jessica is also a senior teacher trainer for The Institute of Qigong and Tai Chi (IIQTC) an organization that trains future Qigong and Tai Chi instructors. She currently teaches classes for the City of Santa Barbara Parks and Rec. Dept., City of Carpinteria Parks and Rec. Dept., Santa Barbara Village, various Senior residences and exercise studios in the Carpinteria and Santa Barbara area. She offers workshops at least once a month and provides continuing education units for Acupuncturists. 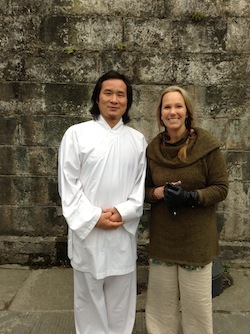 In April 2013 Jessica studied Wudang Qigong and Tai Chi with Master Zhou Jing Bu in the Wudang Mountains of China. What an experience to visit and study in the birthplace of Tai Chi. Last September she continued her studies with another teacher from Wudang, Master Bing. Jessica has studied martial arts, dance and yoga, but it wasn't until practicing Qigong that she understood the powerful self healing energy of her own body, mind and spirit. 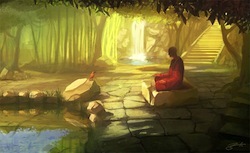 Qigong and Tai Chi has improved her balance and over all physical, mental, emotional and spiritual health. It is Jessica's great honor to share these ancient methods of healing with others. Jessica offers Qigong and Tai Chi sessions via Skype. Using your computer, take a class anywhere in the world. Animal Frolics is one of the oldest and most revered classic forms of Qigong. Hua Tou was a famous physician during the Eastern Han Dynasty (circa 200 CE.). He is famous in the history of Traditional Chinese Medicine as the first doctor to successfully practice abdominal surgery and for creating the Five Animal Frolics. The Five Animal Frolics are movements designed to mimic the energies and strengths of five different animals: the crane, bear, tiger, monkey, and snake. The five animals also correspond to the five elemental energies as well as the five seasons, with the fifth season being late summer. According to Traditional Chinese Medicine history, the Qigong exercises developed by Hua Tou have been proven to be some of the most effective for restoring health and promoting vitality. The book of Chaung Tze (also spelled Zhaungzi, which dates to at least the 300's BCE) mentions the benefits of mimicing the physical movements of certain animals, so the practices attributed to Hua Tou likely arose much earlier. Jessica Kolbe Animal Frolics Qigong - IIQTC (video 54:16). These are more vigorous Qigong forms. The five animals in the exercises are the bear, tiger, monkey, deer, and crane. They are said to improve functioning of the lung (tiger), kidney (bear), liver (deer), heart (crane), and stomach (monkey), respectively. The tenth anniversary edition of William Martin’s free-verse interpretation of the Tao Te Ching, written expressly for those coming into the fullness of their wisdom Lao Tzu’s Tao Te Ching, one of the world’s most widely read books of wisdom, reminds its readers that the sage has been venerated in China for thousands of years. In this free-verse interpretation of the Tao, William Martin subtly and powerfully captures the complex emotions connected with growing older. He encourages today’s sages to recognize their inestimable worth in a youth-centric world that often goes astray: “Will I be able to harvest my life in compassion and love for the world? Will I find in my own heart the wisdom for which I long? This question trumps all others for me. I suspect it is the same for you.